Members of the New York Guard Honor Guard prepare to fire a salute volley in honor of Pvt. William Logan Gwinn, a New York National Guard veteran of the Spanish American War and postal employee on board the RMS Titanic. Gwinn died at his post 100 years ago during the Titanic’s tragic sinking April 14, 1912. Photo by Warrant Officer Ubon Mendie, New York Guard. 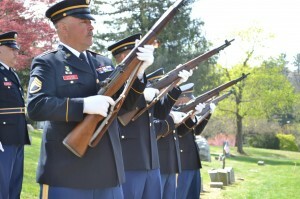 MOUNT HOPE CEMETERY, Greenburgh -- Members of the New York Guard’s 88th Brigade Honor Guard memorialized a former Soldier lost a century ago aboard the RMS Titanic here April 14. The memorial commemorated the service of a New York Guard member who perished while serving in his postal duties on the doomed ship 100 years ago. The troops joined two descendents and a postal service representative with local officials to remember the tragedy of the Titanic and the devotion of duty of New York Guard Pvt. William Logan Gwinn. Gwinn, 37, was a veteran of the Spanish American War with the New York National Guard’s Company D, 71st U.S. Volunteer Infantry Regiment. The 71st saw action in Cuba at the Battle of San Juan Hill on July 1, 1898. He had family in Asbury Park, N.J. and was originally assigned to postal duties in England aboard the Philadelphia. When he received word of his wife’s illness, he transfered duties to the Titanic in order to return to the states sooner. Gwinn was last seen on C Deck of the Titanic with fellow postal employees, attempting to secure the registered mail on board the sinking ship on April 15, 1912. Three American and two British mail clerks died in the disaster, and none of their remains were recovered. The gravestone for Gwinn at Mount Hope is part of a plot honoring veterans from the Spanish American War.